October | 2014 | Frank & Donnis Travel Blog "the more we see the more there is to see"
As is usually the case, the week begins slowly as we have not yet made any plans. In the morning I sat around the park at the bottom of our street and wandered up to our clubhouse and pool to take photos. Local Biggera Duck. 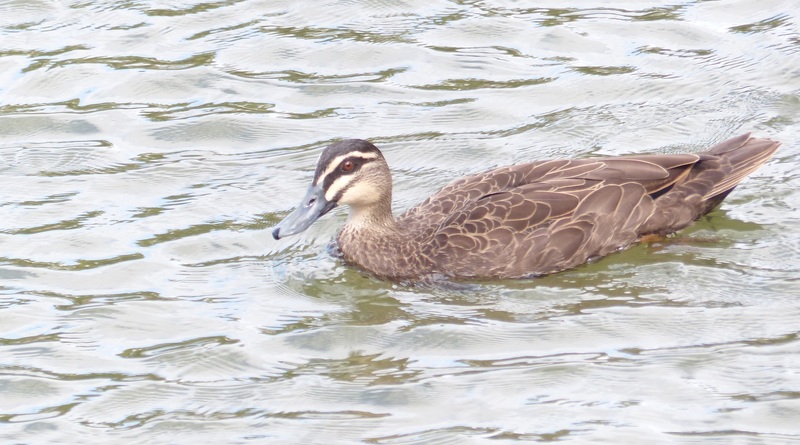 No the ducks are not known as Biggera Ducks but rather this is a local duck from Biggera Creek. 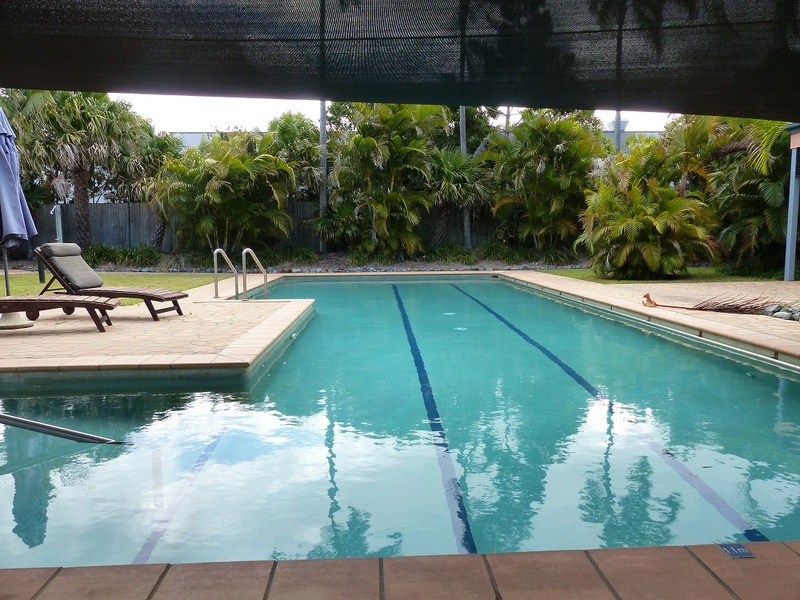 This is our heated pool. Today we took WWWGO for a 100,000Klm service. A timing chain or belt is usually required at this service so they needed WWWGO for two days to obtain the parts and carry out the full service. After delivering WWWGO to the Iveco Service Centre we drove to Robina where Donnis had another round of acupuncture. Now here is something unusual which should be mentioned. Acupunture is not normally part of mainstream medicine. It is usually considered a complimentary or an adjunct to traditional medicine. Therefore it does not normally come under the control of Medicare. Where possible, Donnis and I choose doctors who provide a bulk billing service. For our overseas visitors, Medicare is the universal health care system in Australia which everybody pays for. Bulk Billing is the practice of the doctor accepting the Medicare Scheduled Fee in full payment of a consultation. They do not charge an additional fee to bring their fees up to the Australian Medical Association Scheduled fee which could be $20 or more than the Medicare scheduled fee. The unusual part is the doctor Donnis saw provides acupuncture as part of a bulk billing process. From a financial point of view that is good value. But… the practice is 21 Klms from home. Somehow we need to find a doctor who does, bulk billing to include acupuncture and osteopathy and naturapothy as well as traditional medicine. and is closer to home. Given there is about one million people living in this area I am sure we can find anything we want. In the afternoon we had a measure and quote to have ceiling insulation and whirly birds installed. (Whirly birds are a roof mounted wind powered turbine ventilator which extracts hot air from the roof/ceiling cavity, along with R.30 insulation batts it should help to keep our house cooler in summer and warmer in winter). It was interesting to note the man doing the measuring used a laser measuring device. Not only does it measure, without need of a tape or second person, it saves all the measurements and calculates the square metreage of an area. It can also calculate volume of an area. 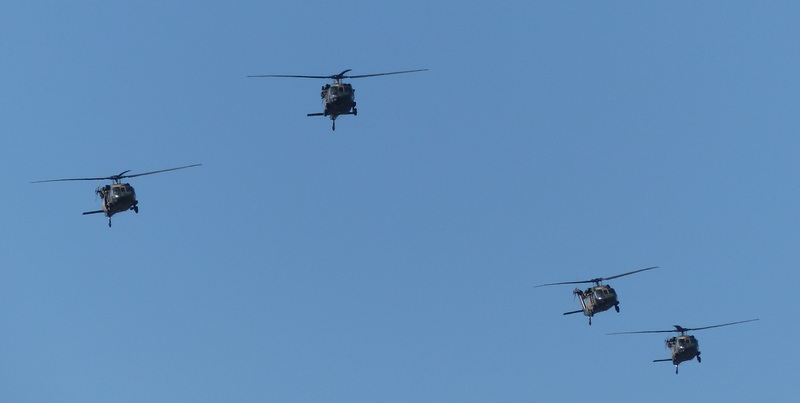 For most of the afternoon and until around 9.30 PM, there were four Blackhawk Helicopters flying in formation between Brisbane and the Gold Coast. 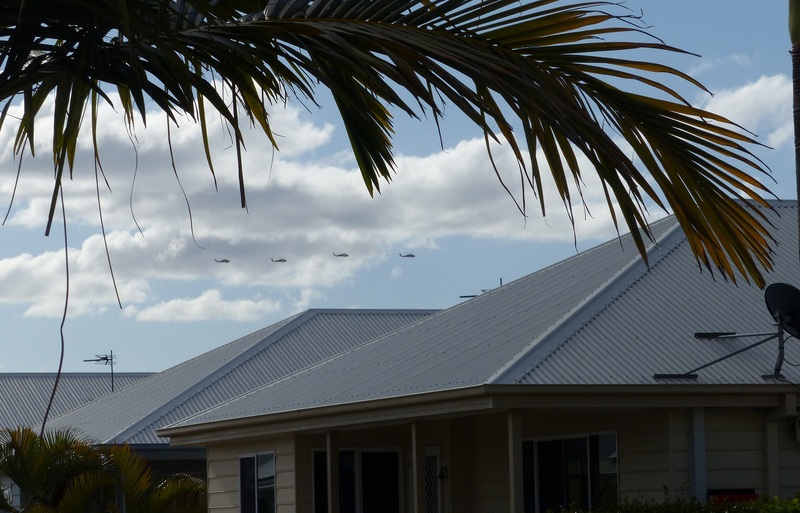 They passed over our home at least a dozen times. Strangely the night flights seemed to be at a lower altitude. 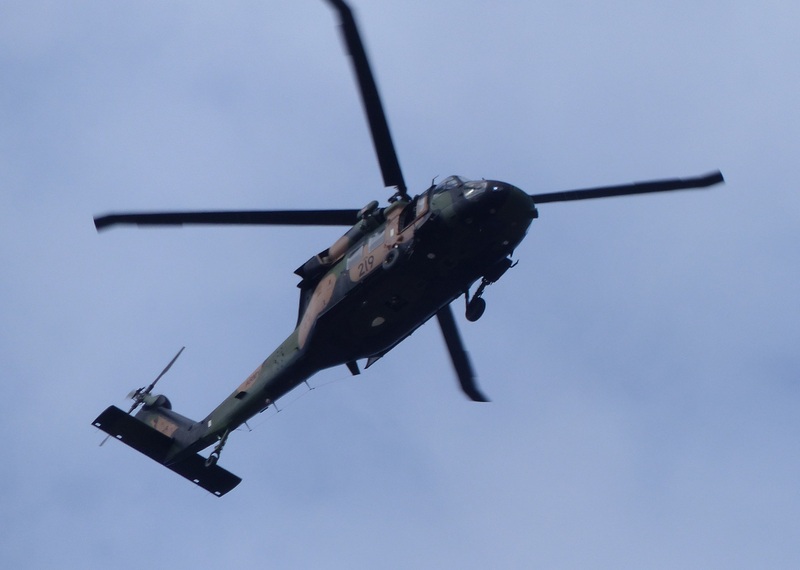 The choppers are training for security reasons for the G20 Conference to be held in Brisbane the third week of November. The national leaders of USA, China, Russia, India, Japan, England, France and Canada to name a few will be in Brisbane and the biggest security operation ever in Australia will be in full swing. 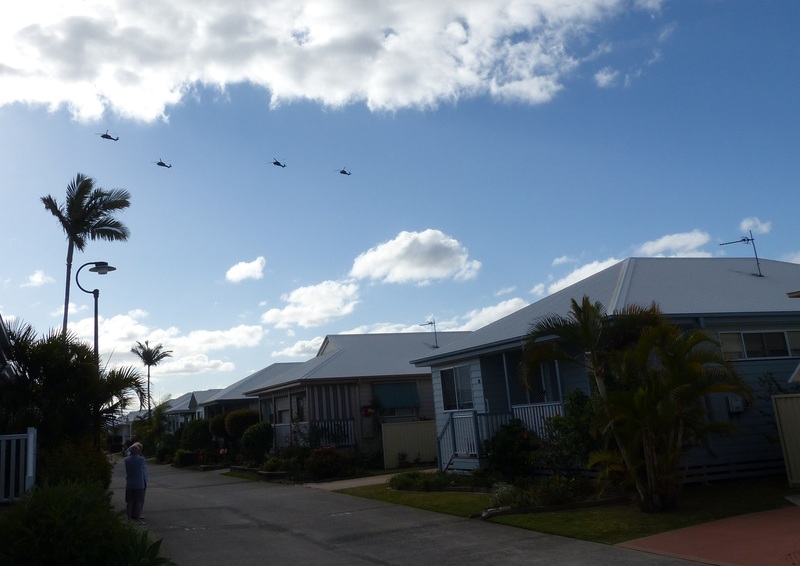 Blackhawk helicopters flying in formation towards the Gold Coast. We had another two quotes for roofing insulation. One told us he had been in business for 23 years and everybody else is a shyster. He also claimed whirly birds are useless. He measured up using a laser device. In the afternoon another insulation person showed up to give a quote he used a traditional tape measure and needed an offside to assist. He claims whirly birds are essential. Later we collected WWWGO and battled Gold Coast traffic in both directions to bring it home. In the morning we started cleaning WWWGO and emptying our bits and pieces accumulated over the last 5 years. We had lunch at Dublin Docks an Irish style pub on a canal near home. We met up with Val and Sue R. Val and I had been members of a motorhome forum for several years and we met at a forum rally at Maleny several years ago and have kept in touch off and on ever since. In the afternoon Val helped me to discover my 32Gb micro card in my dash camera is stuffed. We tested one of his micro cards and installed it in my dash camera. More cleaning and tidying of WWWGO today. It looks quite good especially now it is almost empty. Late in the aftern0on I gave RALLYE a bath as I am driving to Armidale tomorrow and it is a good feeling to drive a clean car. After my ritualistic mid -morning coffee I left for the big drive to Armidale. I am once again required to appear in court as a character witness. I was there a month ago and did not get called so heres hoping I get called early tomorrow and can come home in the afternoon or on Tuesday morning. 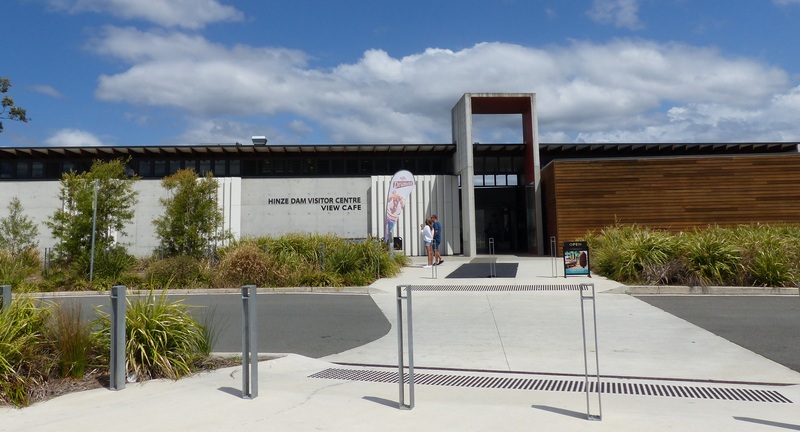 It is a seven hour drive and involves a double transit ( that is up over the range, down into a valley, up a another range, down into a valley and final ascent to the top of the range) of the Great Dividing Range exiting at Tenterfield which is around 1,100 metres above sea level. After Tenterfield I stopped for fuel at Glen Innes and just as I was leaving town, the sky turned black, the wind increased in intensity and big fat drops of rain bashed against the windscreen. The rain became heavier and visibility less. What the??? This storm felt like Déjà Vu as I had encountered a similar storm in this same town on at the same time of day on 3rd December 2012 as I was leaving town. The only difference between then and now was lots of lightning then. Twenty Klms down the highway the sun appeared and the roads were dry. No rain has fallen here for many weeks. I arrived in Armidale late in the evening. In this case later than shown on my dashboard clock as this city is in NSW and therefore is on Daylight Savings time and hour ahead. I just had enough time to book into the motel and head over to the Thai restaurant before they closed. One thing I did notice however. The nice clean shiny car I left the Gold Coast in is now covered in road grime from the storm earlier in the day. Can you believe, today we test drove another NEW CAR! We went looking for a Subaru Liberty. For some reason we ended up looking at a Subaru XV which seems to be a crossover between an Outback, a Liberty and an Imprezza. As you may know I already have a 19 year old Liberty and when you kick down on the gas pedal the car drops down a gear, growls and takes off in a neck snapping leap. I love it. The XV on the other hand when you kick down on the gas pedal there is no sensation of a drop in gear, there is no growl just a sort of a whine and there is acceleration but not the neck snapping variety. The dealer is keen to do a deal…I guess that’s why they are called dealers… but we could not agree on a trade figure and walked away. The Hyundai dealer called today with their offer but it too was declined. Most of the week was spent putting the finishing touches on the curtains and preparing a new veggie patch and putting in a new micro spray watering system. Tonight was Wine n Cheese at the clubhouse. There were about 60 attendees of ages ranging from 55 to 95. Oops some of those older imbibers imbibed steadily. A dance band called The Mad Hatters played their hearts out with all the music from the 60’s. Whewee! It was the first time Donnis and I have been on a dance floor since….well we don’t know when. We finally got home to bed at 1am. Needless to say we had a wonderful night and got to meet many new people. Those older members just loved a drink and getting on the dance floor. Good on em! Donnis had acupuncture treatment while I got lost in the Robina Town Centre. 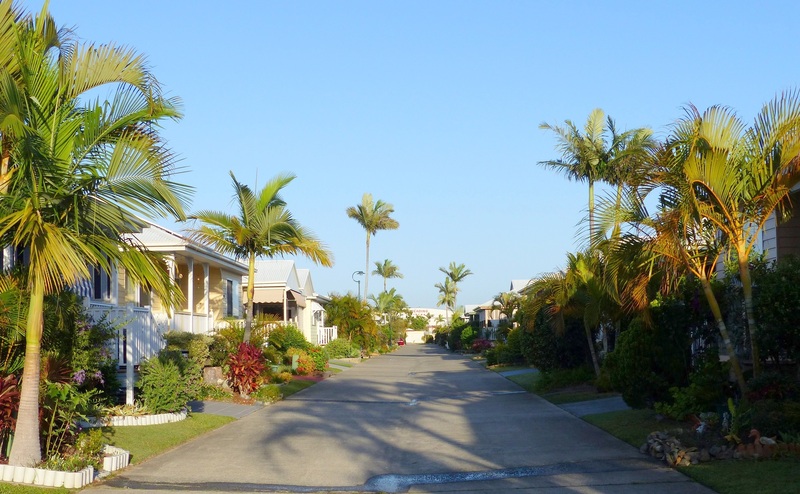 When we arrived home we had burgers from the Indian takeaway store at Harbourside Markets at our back gate. Donnis had a spicy fish burger while I went for a Tandor Chicken burger. These burgers were huge and satisfying and the best thing of all was they were only $5.99 each. I cannot help comparing that to a McDonalds pseudo burger for around the same price. 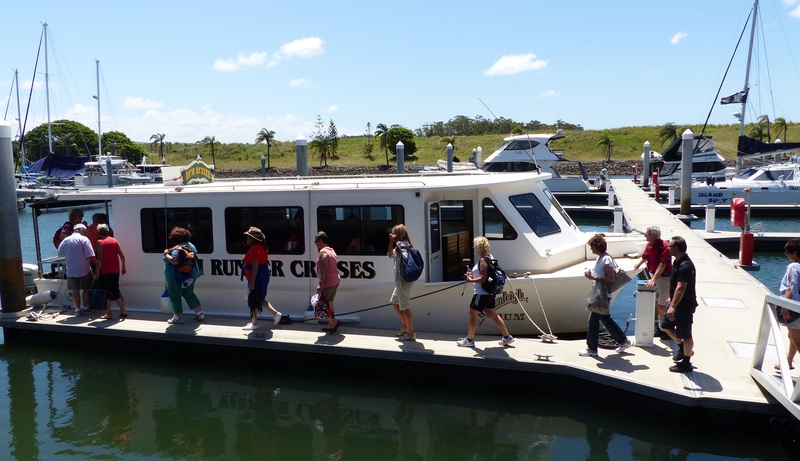 The good ship Rum Runner which took us to South Stradbroke. Note the kangaroos lazing on the bank above the bow. Boarding our boat for the day. 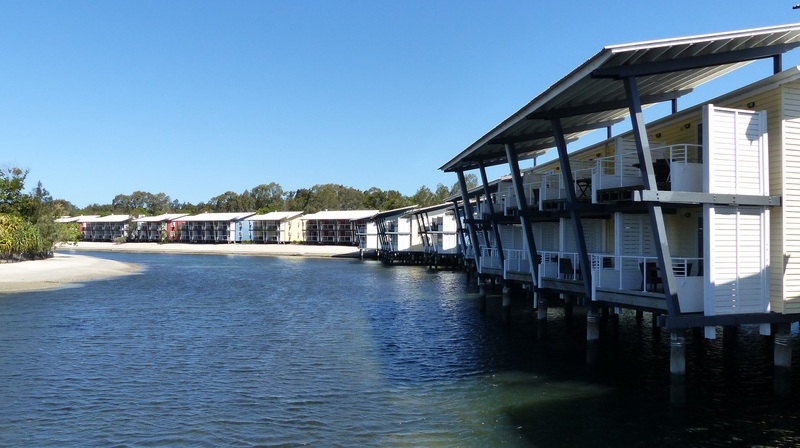 Some of the resort cabins built out over the water at Couran Cove on South Stradbroke. 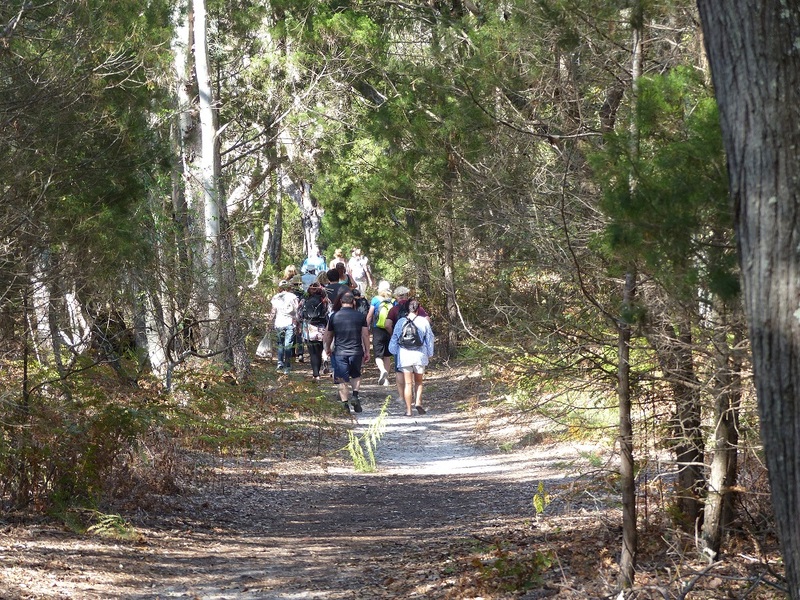 This was an organized trip for a club called The Gold Coast Cruise and Walking Club. 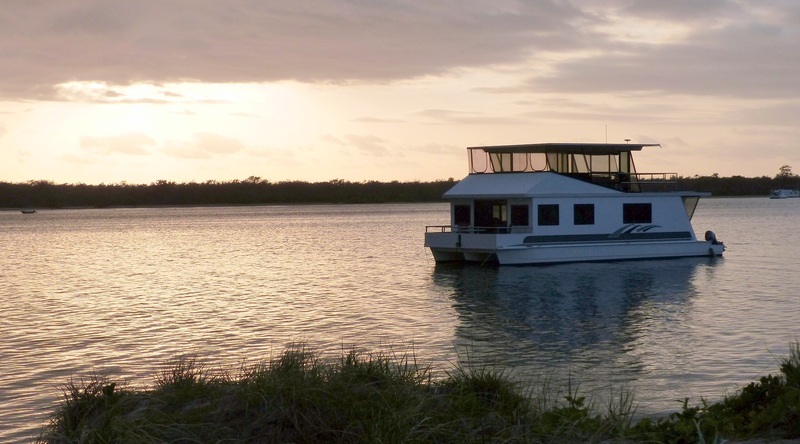 The trip consists of the boat trip to the island, lunch at the resort and a two hour bush walk across the island to the ocean and back to the resort. 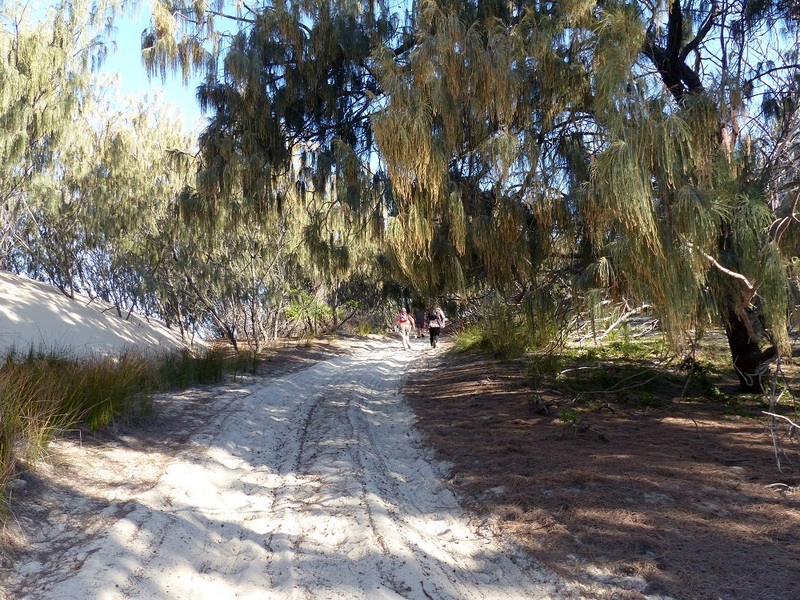 The beginning of the bush walk on the western side of Stradbroke Island. 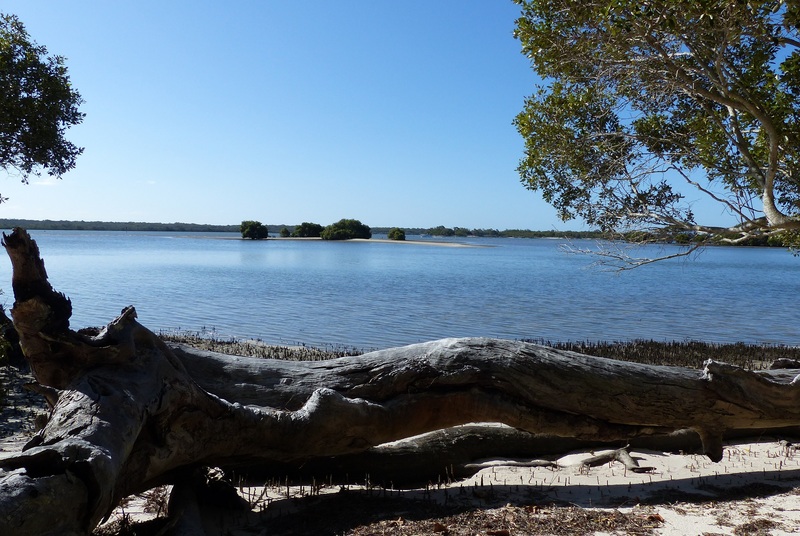 One of many small islets just offshore of South Stradbroke Island. 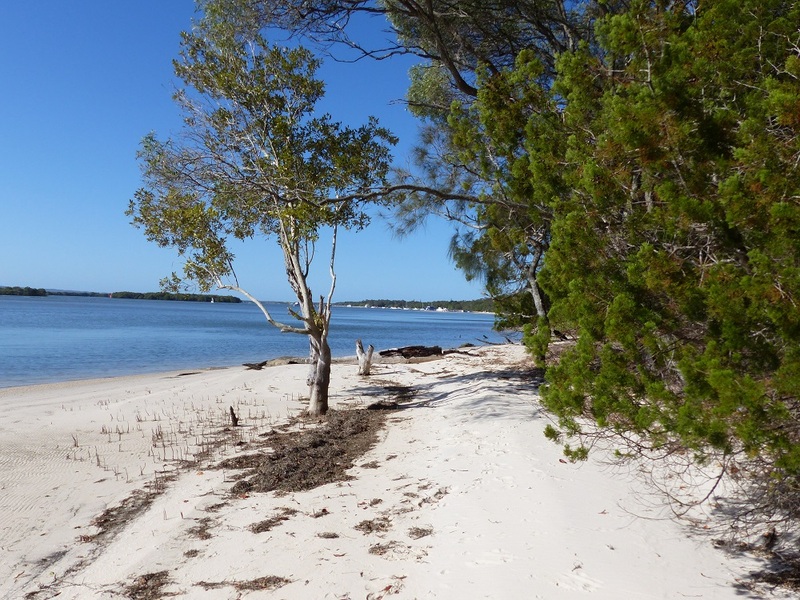 past several private lease camp sites maintained by various boating groups, past the open to the public campground called Tipplers Campground which even has a licensed restaurant. Tipplers Resort Camp Ground in the distance. 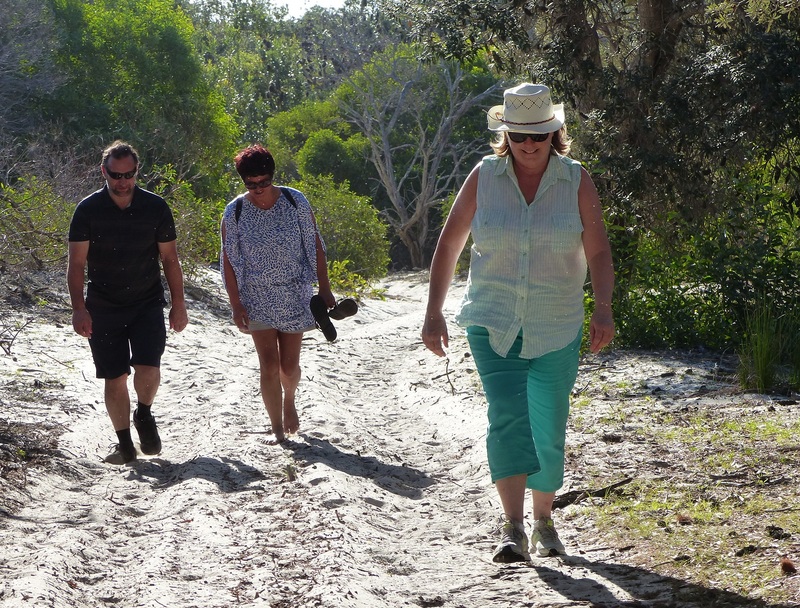 Gradually the track became steeper with the sand becoming softer making the walking more difficult. The long gradually steepening track to the top of the sand dune. Donnis powering up the sandy track – despite her knees crying out in protest. 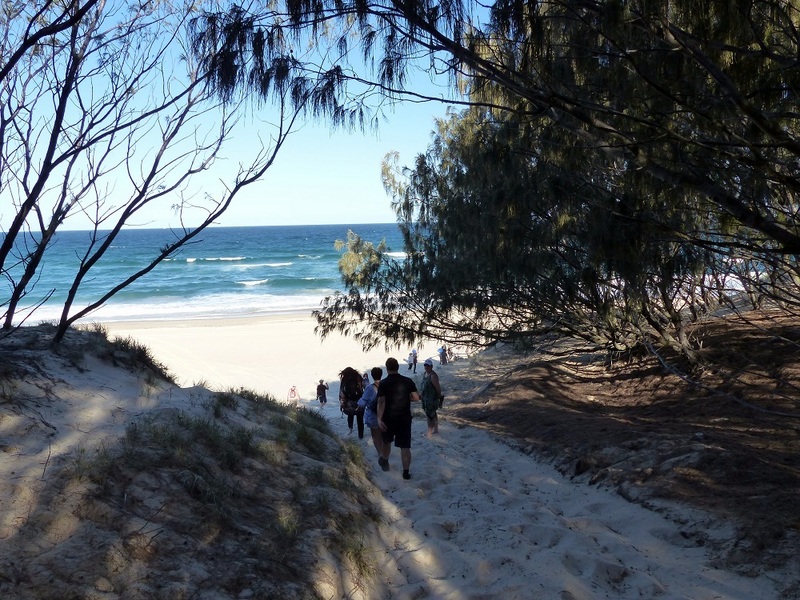 Finally we reached the ocean side of the ocean and a steep slide walk from the high sand dune in soft sand to the beach below. Slide walking down the steep sand dune to the ocean beach. 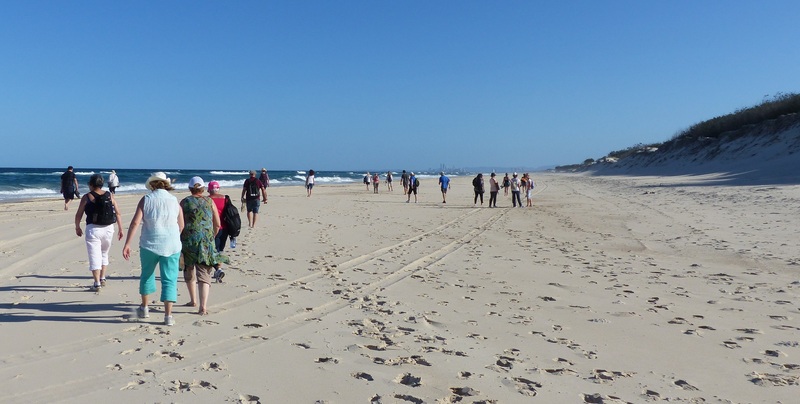 As the walkers spread out across the surf beach it became obvious that one of the walkers was struggling. 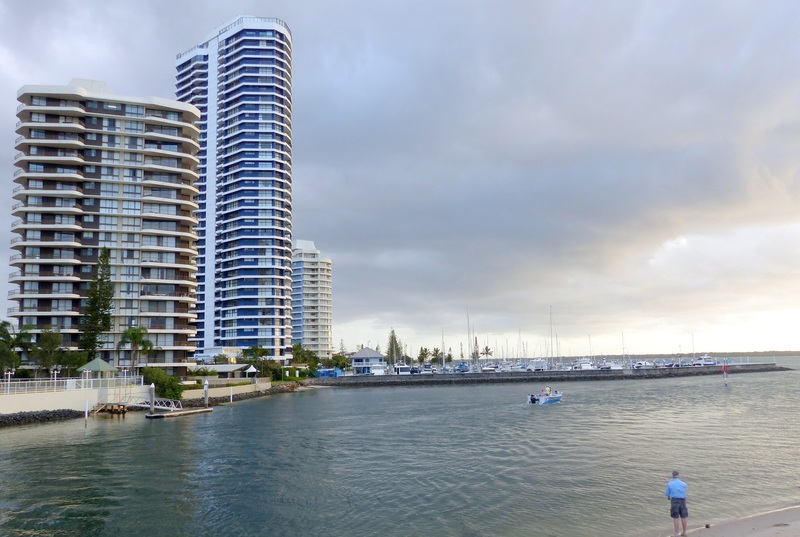 The skyline of Southport and Srfers Paradise can be seen from many locations around the Gold Coast. The beginning of the long trek along the ocean beach. 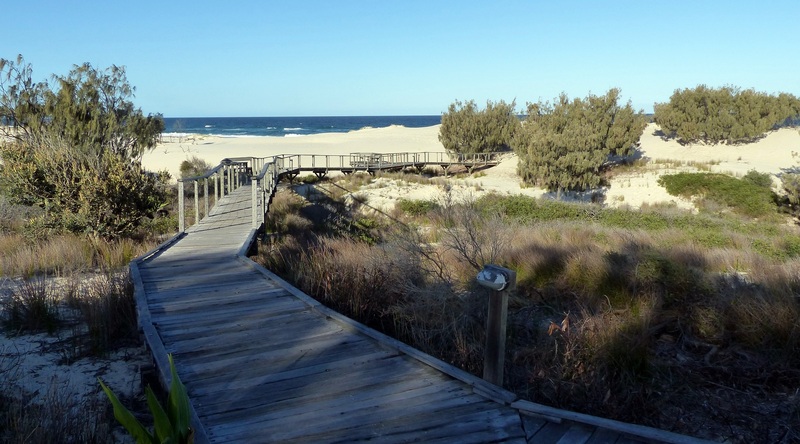 The boardwalk below the Sruf Club at ocean beach on South Stradbroke. As in many other places on the island the sandhills are marching slowly but surely across the island. Look closely at the end of the boardwalk and you can see it is now covered by sand. 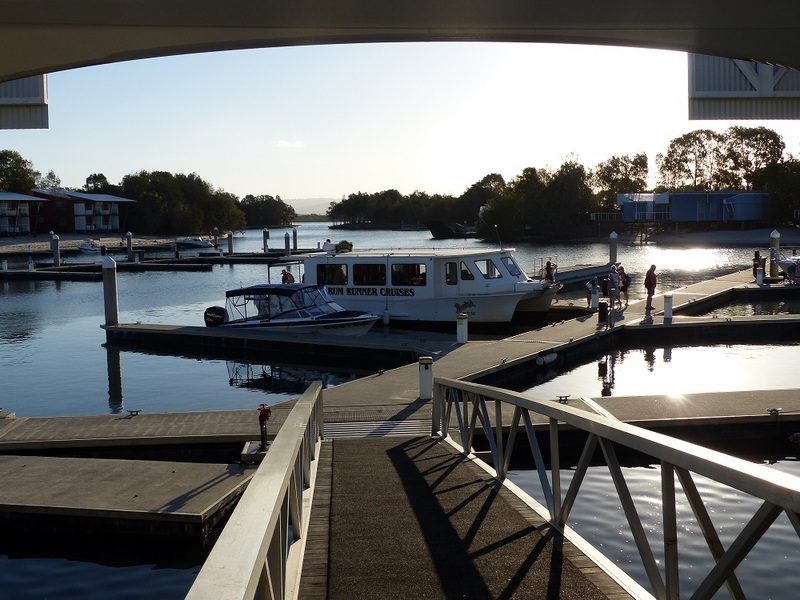 Couran Cove Marina on South Stradbroke Island. 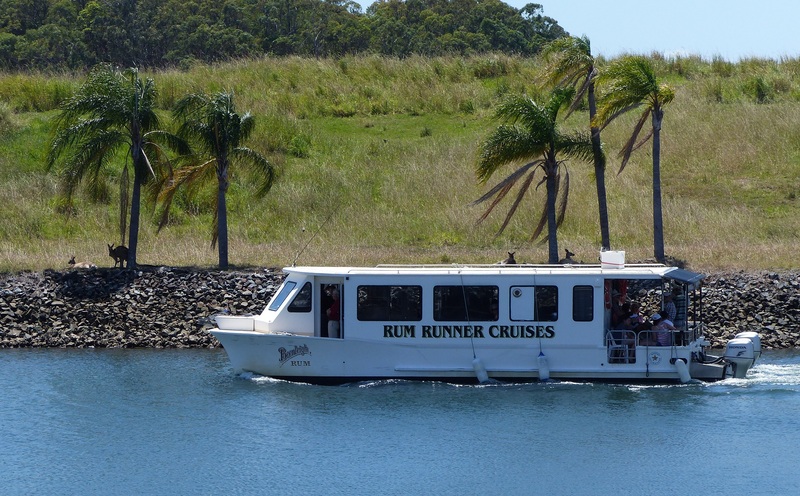 Rum Runner is waiting for final passengers to depart at 5pm. for the cruise back to Hope Harbour Marina our starting point on the mainland. A stunning sunset ended an equally stunning day as we entered the marina. 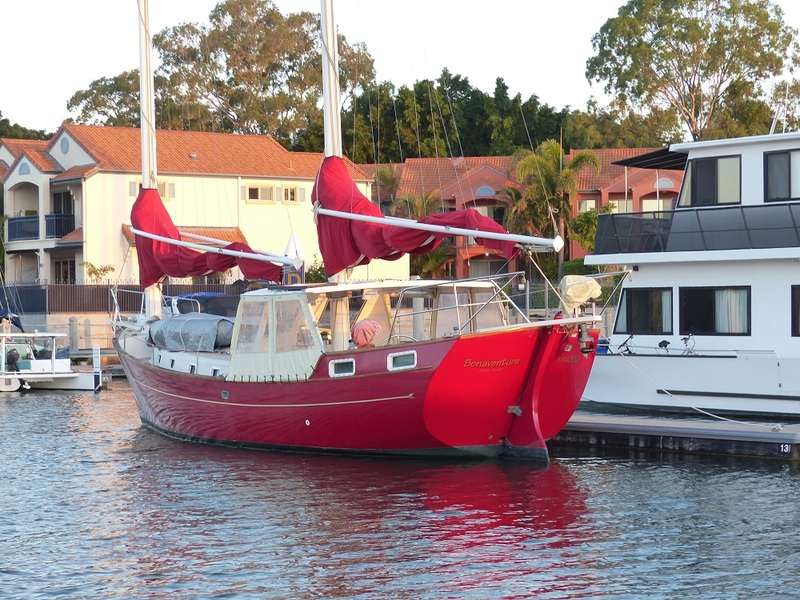 An unusual design ketch at Hope Harbour Marina. Sunset as we arrive at Hope Harbour Marina. Sunset at Hope Harbour Marina. By the time we arrived home and we had a shower and a light meal we were ready for bed – exhausted after an enjoyable day. The madness has begun. Yesterday the southern states of New South Wales and Victoria switched to daylight savings time. 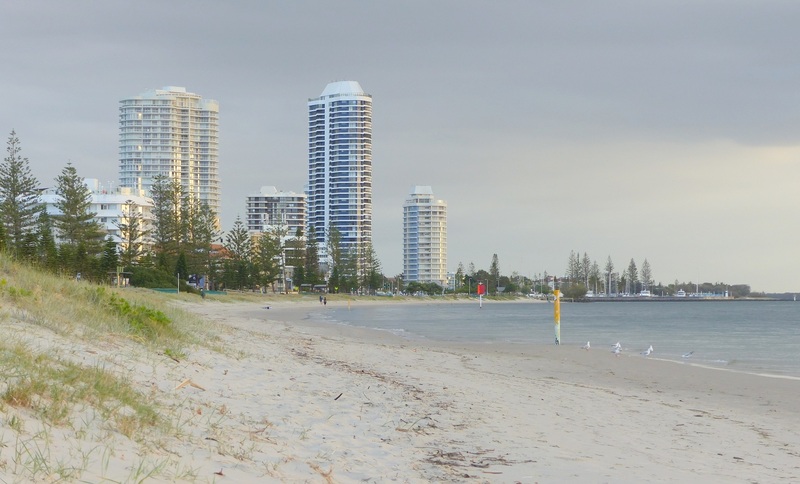 With the border between Queensland and New South Wales less than 50 klms away and the twin towns of Coolangatta and Tweed Heads, both of which straddle the border, will be more out of step than the rest of the states. 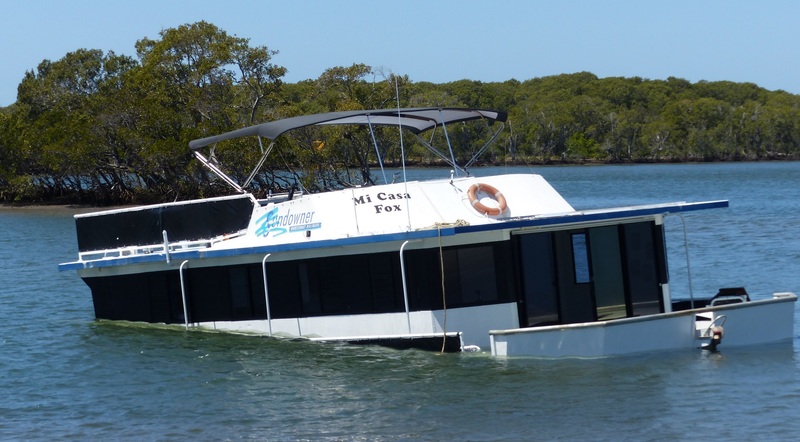 Rental houseboat. What caused the craft to sink in relatively sheltered waters? Runaway Bay and Paradise Point. 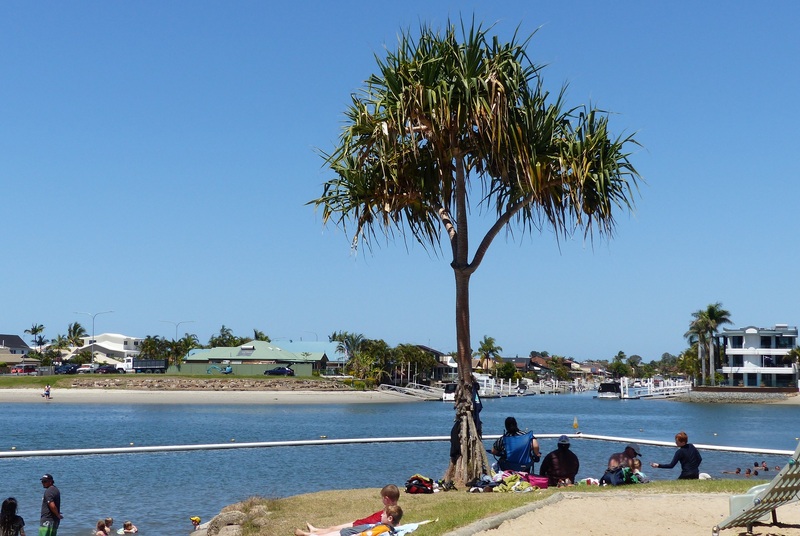 We stopped at Coomera River so Donnis could take a swim. Lots of tenders were scattered around the beaches in this sheltered anchorage. The number of people picnicking and barbecuing and kids yelling and running and swimming shows what a popular family place this is. There is a floating enclosure to create a safe swimming environment. The canal system, which is connected to the ocean has lots of sea creatures doing what sea creatures do. That includes the terribly aggressive Bull Shark. During our visit a large jelly fish was pulled from the enclosure. With thanks to the Queensland Museum for this photo of a jellyblubber. These are not the deadly chironex flexarii otherwise known as the Box Jellyfish found in tropical water further to the north. This jelly fish was just the common ordinary blue tinted body, jellyfish (locally they are called jelly blubbers) which when you bump into them in the water gives you a creepy feeling. They can sting. Their sting is much like a tingling sensation if the small tentacles are touched. 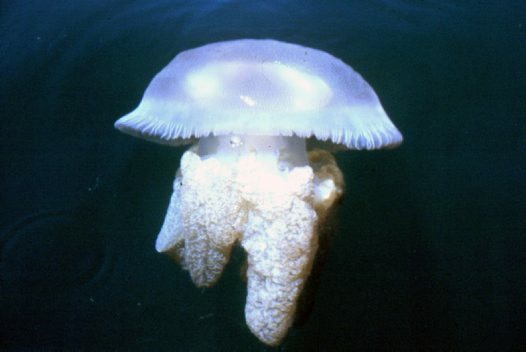 (In Sydney waters, the Jelly Blubber’s large bell is a creamy white or brown colour, but farther north it is usually blue. This is because the jellyfish has developed a symbiotic relationship with algal plant cells that are kept inside its body. These plants vary in colour from region to region. The algae photosynthesise, converting sunlight into energy that can be used by the jellyfish.) Unlike the box jellyfish which trails 16 tentacles up to 10 metres when a touch, even from an unattached piece of tentacle will produce agonizing pain. Get a touch from a full tentacle and the pain produces unconsciousness and death. Although this jellyfish was not potentially lethal I can understand why a group of fathers got together and removed it from the enclosure. There was a Blood Moon tonight. 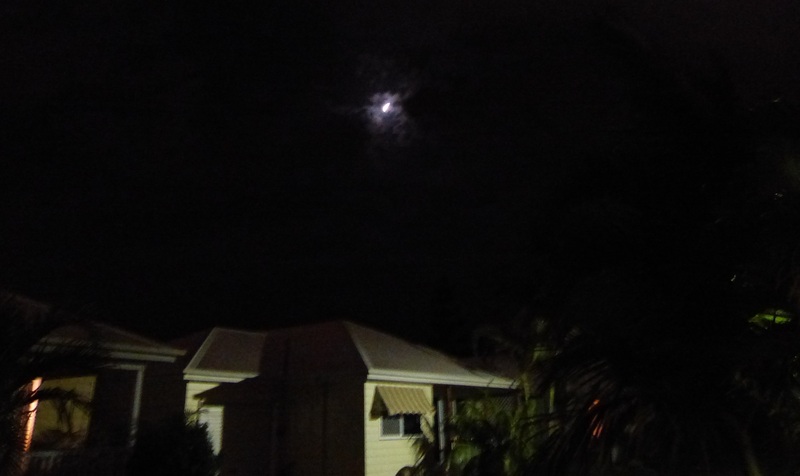 Blood Moon seen over our neighbours house. Blood Moon. We were fortunate the clouds parted just long enough for a couple of photos before obscuring the view totally. A blood moon is a total lunar eclipse. The term “blood moon”: seems to be a new title but belongs to an earlier time. 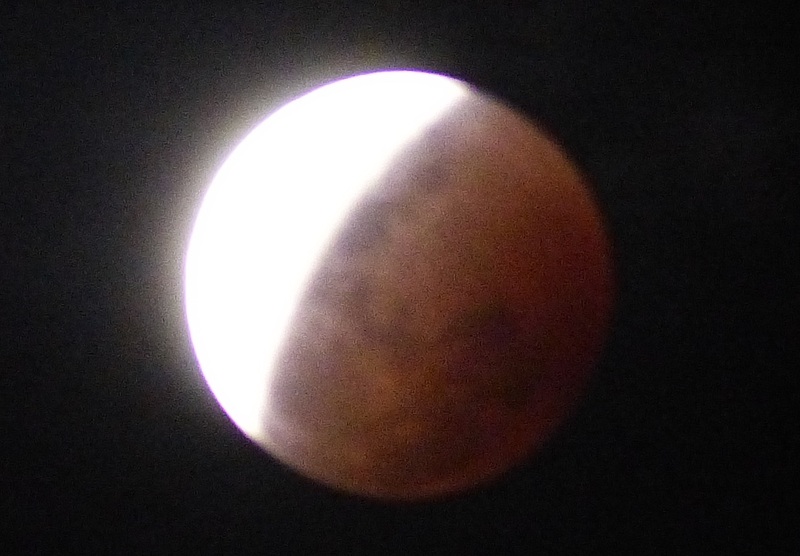 Previously the term lunar eclipse was known as a, umm err lunar eclipse. However in Biblical times it was known as a blood moon and become part of biblical prophecy. Somewhere the term fell out of common usage but has now come back into vogue. The trouble with tonight’s blood moon was clouds beginning to roll across the sky in the early evening. Just as the appointed time arrived a break in the clouds allowed us to briefly see the eclipse and take a few photo’s before the clouds came back and totally obscured the event. There is another Total Lunar Eclipse – Blood Moon – event, due to occur in April 2015. Gosh how time flies! We have been in our new house 4 weeks already and it seems most of that time has been spent shopping or installing window dressings. After installing 50% of the curtain rods using the supplied wall studs I noticed the top screw holding the brackets was beginning to pull out of the wall. Grrr! Here is the problem. The house is steel framed. Unlike a timber framed house where any screw can be used in either the plaster or directly into the timber stud, steel is mighty strong and is difficult to drill and attach a screw. I solved the problem by buying lots of toggle bolts (a wing shaped spring loaded device which when pushed through a hole drilled in the plasterboard snaps open. As the screw is tightened the wings pull against the inside of the plasterboard to give a strong secure attachment. Today we drove to Southport to look at …A NEW CAR!!! Actually we plan on looking at several but more on that as things come together but today we looked at a Hyundai i40 Tourer diesel version. Wow! Today was long and enjoyable. 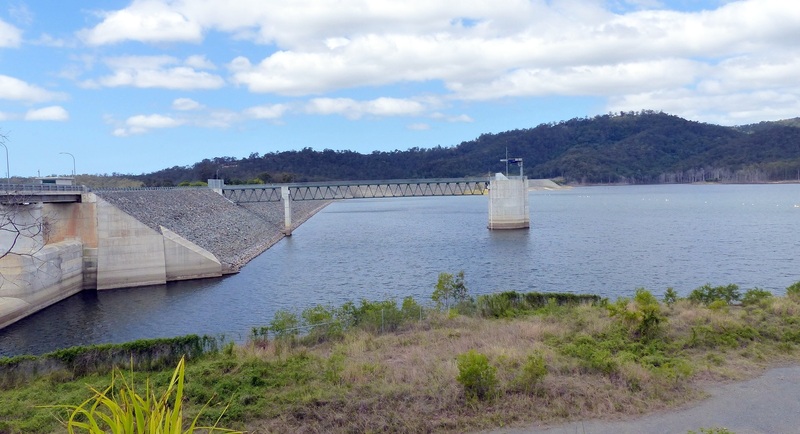 We packed a picnic lunch and drove to the Hinze Dam about 40 klms from home in the Gold Coast Hinterland. 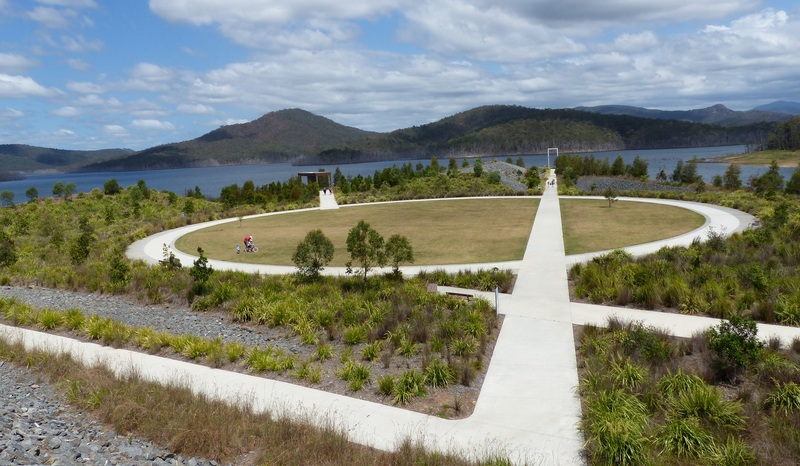 Part of the picnic area at Hinze Dam. The shelters comprise a couple of seats but no tables and no barbecues. 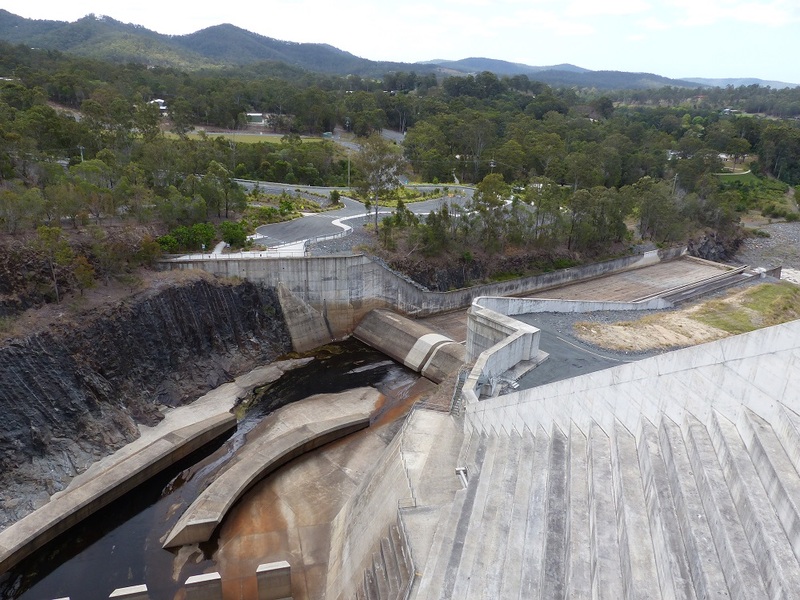 Looking down onto the spillway from the dam wall. 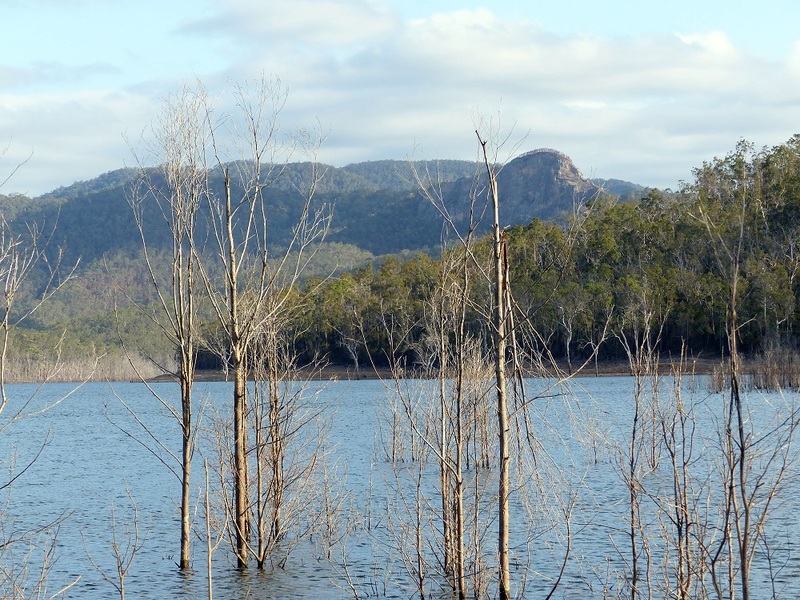 The dam is named after the Hinze Family who lived in the area flooded by the dam. Somewhere in my memory bank is the recollection the dam was named after Russ Hinze a politician with a 40 year career in politics. He served in the unpopular but somehow unbeatable government of Joh Bjelke – Petersen. Russ Hinze was noted as being involved in a number of political decisions which were dubious at best. He resigned in disgrace and died before a Royal Commission looked into his dealings. Call me cynical but Russ Hinze came from the area where the dam is built. The original dam was completed in 1976, expanded in 1989 and again in 2011. 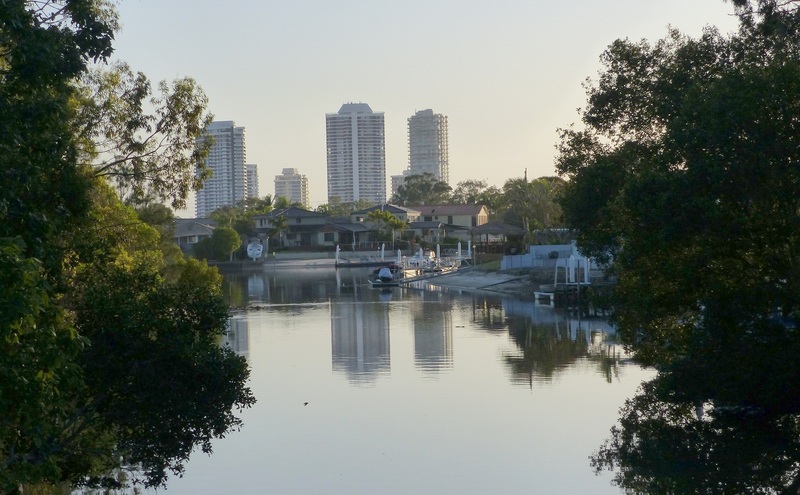 It supplies water to the Gold Coast. We had a picnic lunch of cheese, pate and sourdough bread while seated beside the lapping water of the dam. The lake formed by the dam is called Lake Advancetown. Dead timber on Lake Advancetown with a volcanic plug jumpup in the background. Advancetown itself is set a few Klms from the name and has a Sunday afternoon Jazz Session along with wine and cheese tasting. Darn! We only found out about this attraction AFTER we had driven through the town – twice.It is on our calendar for another visit. 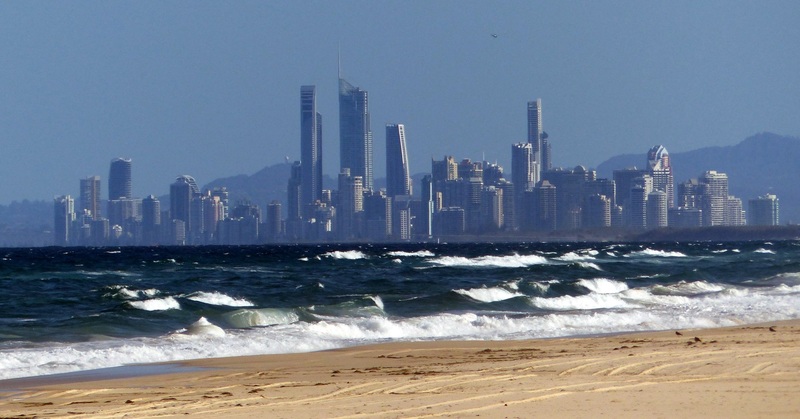 View of Southport on the Gold Coast from near Advancetown. Afterwards we drove a further 30 Klms through the Numinbah Valley to Springbrook National Park to see Natural Bridge, a waterfall like formation which falls through a hole in a natural cave. Natural Bridge in Springwood National Park. Inside the cave viewing the waterfall within Natural Bridge. 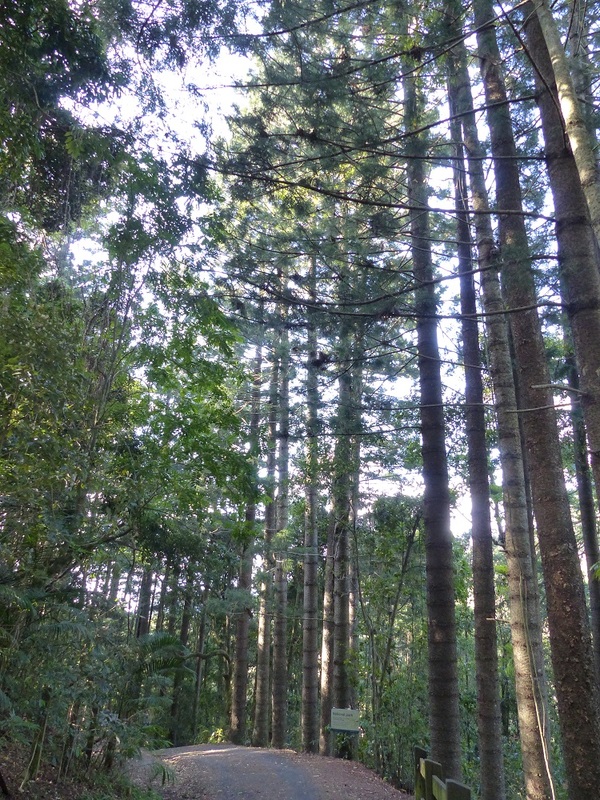 A stand of Hoop Pines amongst the rainforest trees at Springwood National Park. 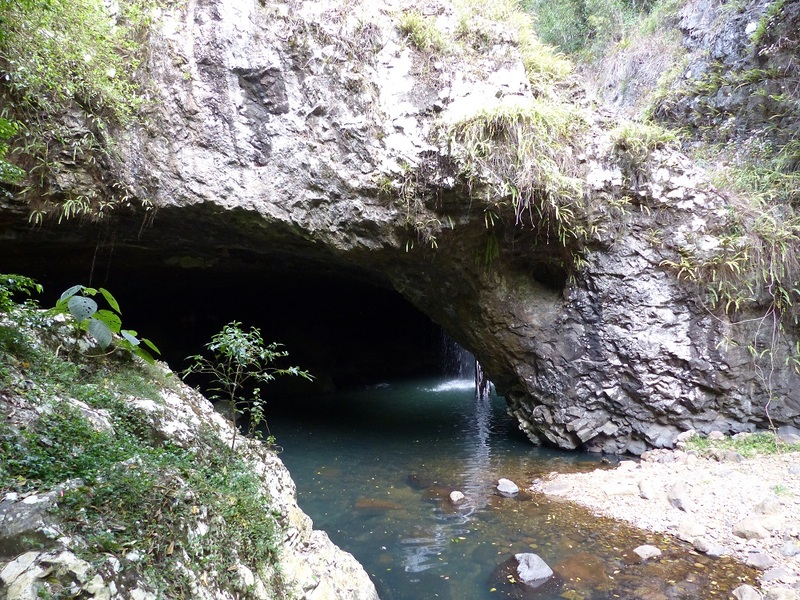 The cave, which extends about 100 metres into the hillside, also has a colony of glowworms. The area was formed by volcanic activity millions of years ago. Several remnants of volcanic plugs are still visible throughout the valley. The waterfall at Natural Bridge is spectacular as the water falls into a deep hole which is lit by the sun giving the water a blue phosphorescent glow. The walk into the valley, although tar sealed and fenced all the way, is rather steep and contains many steps. Donnis has knee problems and to her credit did not give up. To-night my knees are plaguing me also. 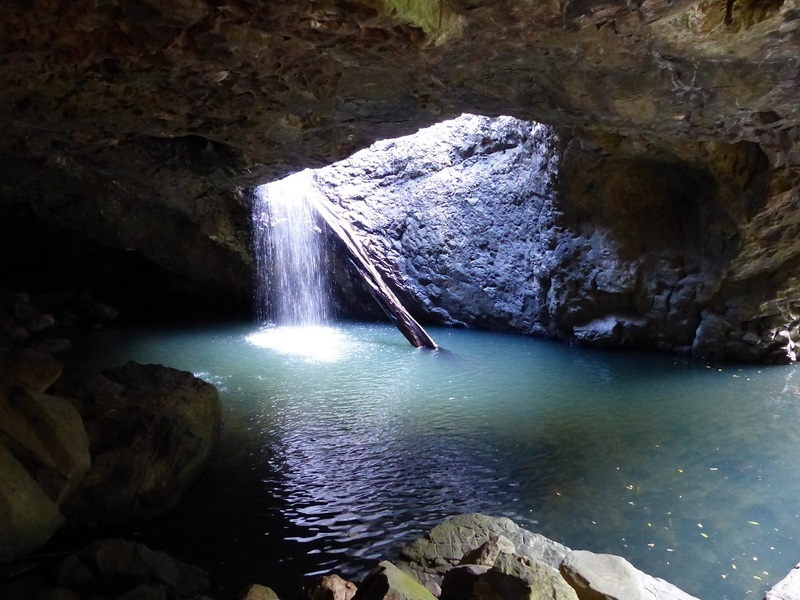 The entire Numinbah Valley and Springbrook National Park is quite interesting as some of the area, formed by volcanic activity is surrounded on two sides by steep sandstone cliffs. 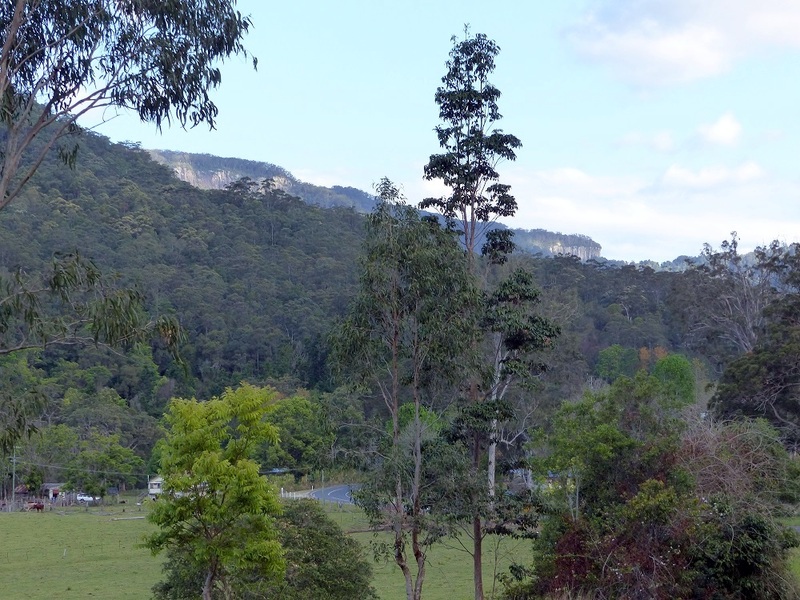 Sandstone cliffs in the Numinbah Valley. 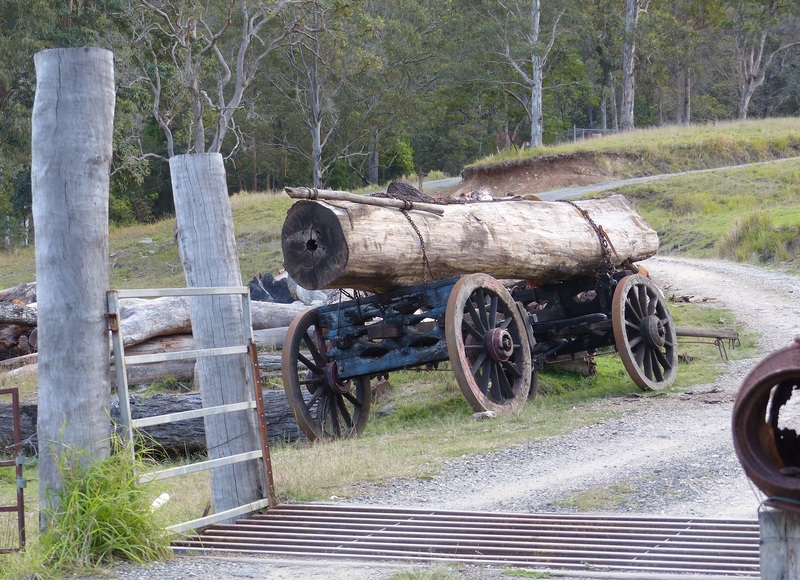 An old style timber jinker. 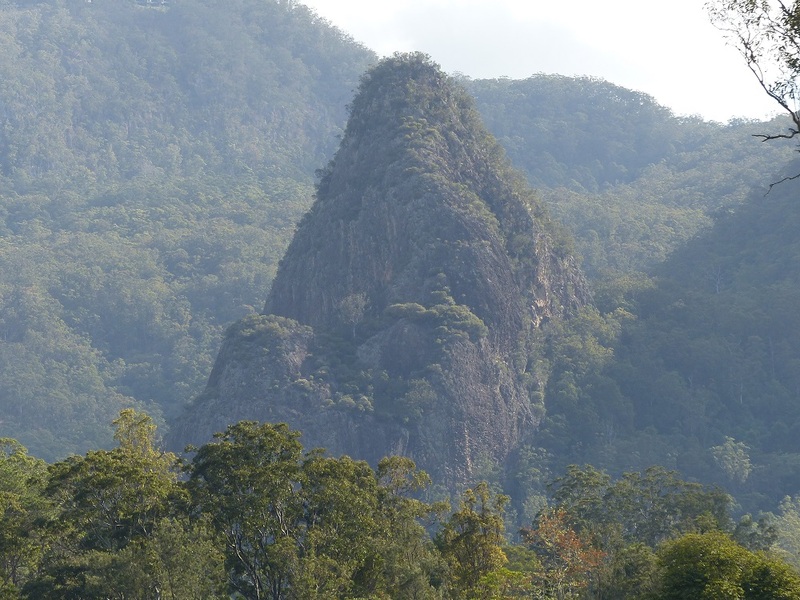 Volcanic Plug in the Numinbah Valley. 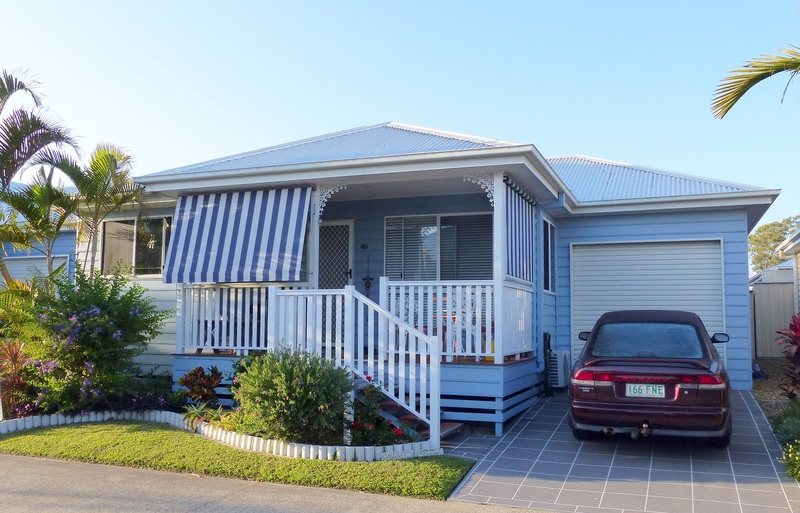 The area is less than an hours drive from the Gold Coast and is sandwiched between those high cliffs and being naturally hilly the road has lots of low speed corners. The speed limit through the entire valley is a maximum of 80 Kph and the road is a favourite of motorcycle clubs for a Sunday loop ride from the Gold Coast south into New South Wales to the town of Murwillumbah then north through the Numinbah Valley to Nerang and back to the coast. It is a two hour ride of around 150 Klms with interesting historic places to stop and have a meal break. We spent a around 6 hours in a spending spree today. We travelled to Ikea and searched for a few items to make life easier in our villa. For example our built in wardrobes are very good but there is no shelving or drawers. Ikea had an ideal set of drawers that will fit into the wardrobes. Of course we found a few additional items. Tonight I had another sports night… Table Tennis. Donnis has a swim in the heated pool every day. All the windows now have venetian blinds installed. Final tweaking and removing of excess slats will be done tomorrow. We put together the two sets of drawers and placed them in the wardrobe. It was simply a long working day. We had lunch on our gazebo on the bank of Biggera Creek. Finally finished all the venetians. Our house is steel framed. That means all the traditional fixing methods for regular houses are not appropriate in our house. Instead of timber fixing screws I have had to buy special steel fixing screws. As well I have had to buy a stud finder so I can find the metal studs so I can screw cabinets to the walls. In the afternoon I started assembling an Ikea bathroom cabinet only to discover that a partition wall was missing vital holes for studs. Grrr! Now I have to make another trip to Ikea to replace the faulty part. 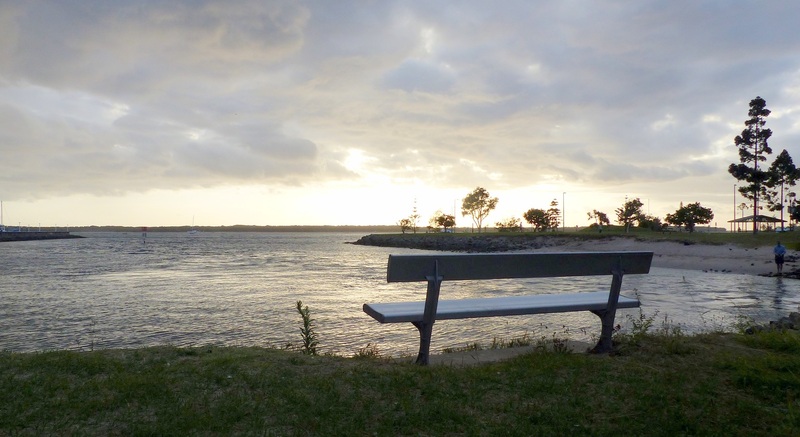 Woke earlier than usual and decided to walk along the Broadwater. I was surprised yet pleased to see so many other people walking, running and cycling with a delightful sunrise as a backdrop. 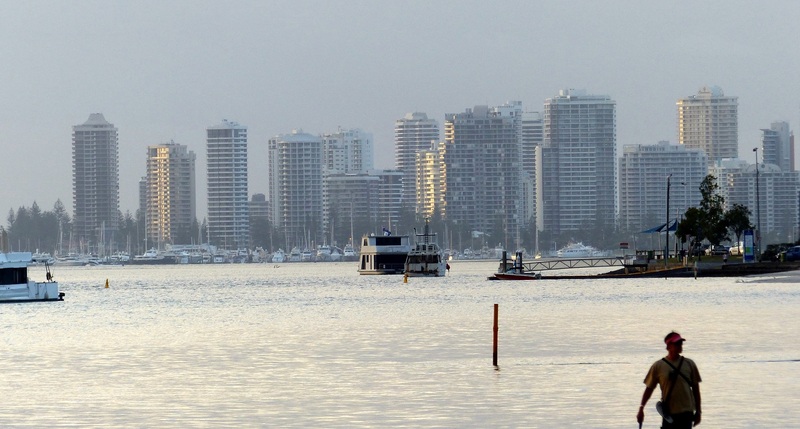 The Broadwater looking south to Surfers Paradise. Ready to watch the sunrise. I had another grrr day today Getting the curtain rods installed is more frustrating than I had anticipated. I seem to be making several trips to Bunnings Hardware to buy screws, wall plugs or toggle bolts. Donnis also decided the curtains she .bought for the bedroom are unsuitable and wanted to return them. We are twenty paces from our own private park on Biggera Creek which becomes part of a huge canal system. This is part of the view. Our House (words and music by Graham Nash Crosby Stills Nash) which really has nothing to do with the photo I just felt like singing Our House. On the street where we live Hmmm! another song springs to mind. 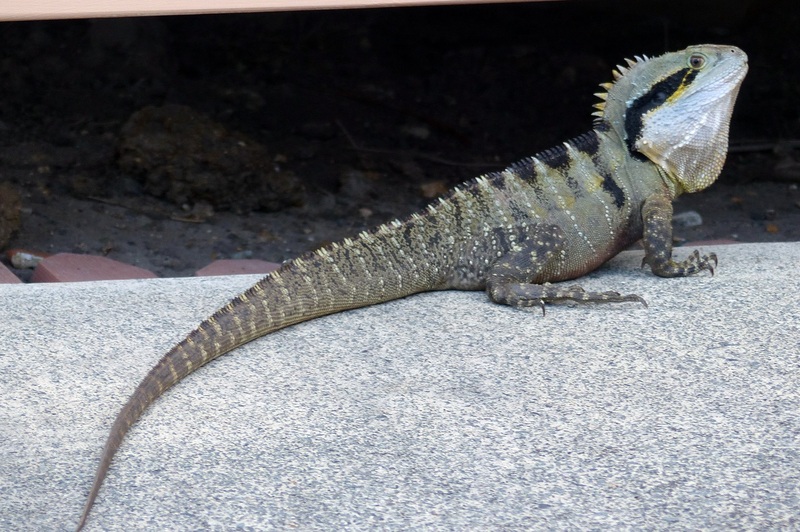 This frill necked lizard lives under the houses. It feeds on bugs and vermin and also the chicks of birds. Our neighbour called out to me me it was on our driveway. I was excited to see it and to take some photos. The neighbour is scared of it and wanted me to chase it away. I felt today was another wasted day but in retrospect I suppose we achieved something. We stopped to return the curtains before going on to Ikea to exchange a faulty panel for the bathroom cabinet. Of course we cannot just go to Ikea to exchange goods. We have to look through the entire store again, stop for coffee and lunch and buy more stuff. More stuff such as curtains. Donnis had heard somebody say are you having bright colours in the new house so she bought burnt orange curtains. They sure are colourful. On our way home we stopped at Bunnings…again. I was so excited about having all I needed to get started on putting up the curtain rods only to find the supplied wall plugs pull out of the wall once the rods are put in place. We lunched again at the gazebo on Biggera Creek. Delightful. I managed to get the curtain rods installed in the lounge room and dining room. I also have to admit – sheepishly – the burnt orange curtains look good. Late in the afternoon we drove to Broadbeach and joined several thousand other people for a free, Opera in the Park concert. 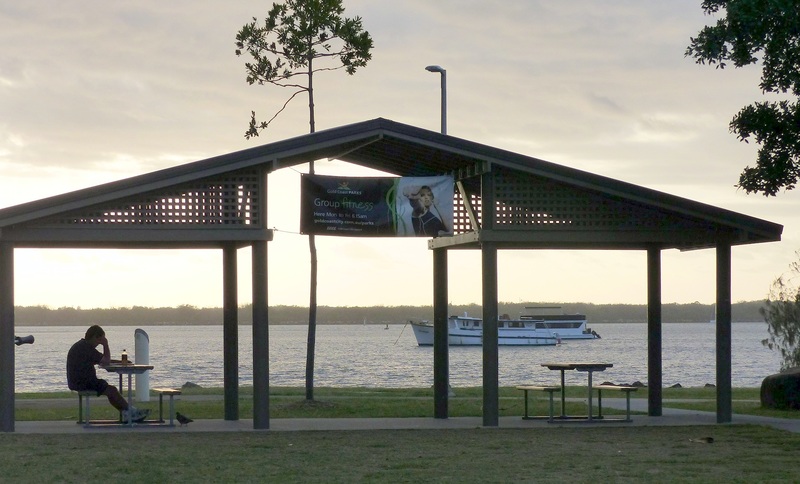 Despite signs all around warning that alcohol laws apply and cannot be consumed in the park, many people, hundreds in fact arrived with fold up tables and chairs, eskies and settled down for dinner with a glass or two of wine…or beer…or mixer drinks. It was all so civilized and we regretted no lugging all our picnic stuff with us. Here is just some of the information about the event “Opera in the Park – ‘Just a Touch of Broadway’. Spread your blanket and kick back to the fabulous music of Opera and Broadway under the stars in Kurrawa Park, Broadbeach. 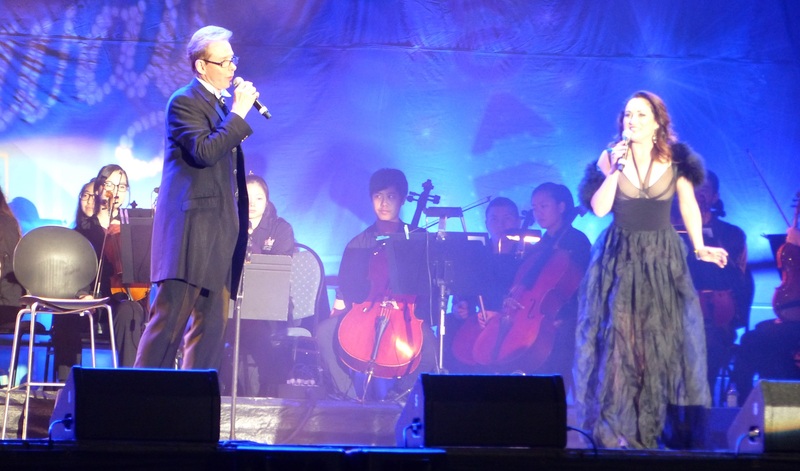 Starring the incredible talents of Amelia Farrugia, Donald Cant, the Gold Coast Youth Orchestra and Gold Cast Youth Choir, the evening will feature classics from hit Broadway Shows such as Les Miserables, Phantom of the Opera, Chess and many more. A truly unique musical experience that will create a night to remember all entirely free! It was an enjoyable night and the civilised exodus from the park by thousands of spectators meant we were able to cruise home along the Gold Coast Highway in just 15 minutes. …and on the seventh day they rested.